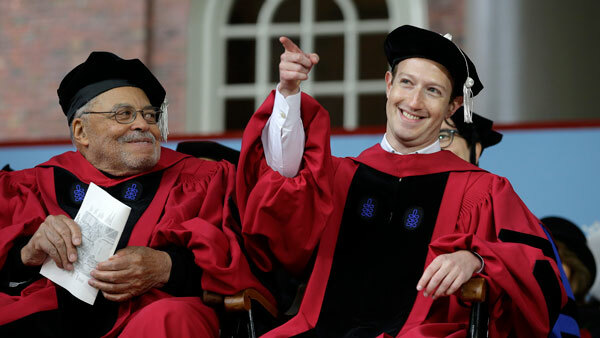 Facebook CEO Mark Zuckerberg returned to Harvard with a message on fighting inequality and taking risks in the name of innovation. Zuckerberg, who, like the graduates, is a millennial, started Facebook in his Harvard dorm room in 2004. He dropped out the following year and returned Thursday to receive an honorary degree. "Let's face it, you accomplished something I never could. If I get through this speech today, it'll be the first time I actually finish something here at Harvard." "My best memory from Harvard is meeting Priscilla. I had just launched this prank website Facemash, and the ad (administrative) board wanted to 'see me.' Everyone thought I was going to get kicked out. My parents drove up here to help me pack my stuff. My friends threw me a going-away party. Who does that? As luck would have it, Priscilla was at that party with her friends. And we met in line for the bathroom in the Pfoho Belltower (a dorm), and in what must seem like one of the all-time most romantic lines, I turned to her and said: 'I'm getting kicked out in three days, so we need to go on a date quickly.'" "Ideas don't come out fully formed. They only become clear as you work on them. You just have to get started. If I had to know everything about connecting people before I got started, I never would have built Facebook." "It's really good to be idealistic. But be prepared to be misunderstood. Anyone working on a big vision is going to get called crazy, even if you end up right." "Every generation expands its definition of equality. Previous generations fought for the vote and civil rights. They had the New Deal and Great Society. And now it's time for our generation to define a new social contract." "We should explore ideas like universal basic income to make sure that everyone has a cushion to try new ideas. We're all going to change jobs and roles many times, so we need affordable child care to get to work and health care that's not tied to one employer." "Millennials are already one of the most charitable generations in history. In just one year, more than three in four U.S. millennials donated to charity and more than seven in 10 raised money for another one. But it's not just about giving money. You can also give time. And I promise you, if you just take an hour or two a week - that's all it takes to give someone a hand and help them reach their potential." "Every generation expands the circle of people we consider 'one of us.' And in our generation, that now includes the whole world. ... But we live in an unstable time. There are people left behind by globalization across the whole world. And it's tough to care about people in other places when we don't first feel good about our lives here at home. There's pressure to turn inwards." "This is the struggle of our time. The forces of freedom, openness and global community against the forces of authoritarianism, isolationism and nationalism. Forces for the flow of knowledge, trade and immigration against those who would slow them down. This is not a battle of nations. It's a battle of ideas."